Passenger flight on rocket-for-hire flings to suborbital space is near at hand. One big draw that adds to the bragging rights for space travelers is the view from high above. Rubbernecking tourists will have face time with space, snagging perspective and images to make a travelogue of their voyages. One major ticket-for-sale vendor set to give rocket riders a suborbital space cruise is Seattle-based Blue Origin, which is headed by billionaire Amazon.com founder Jeff Bezos. Virgil "Gus" Grissom and his Liberty Bell 7 suborbital spacecraft, which launched in July 1961, sported a new window design. The New Shepard capsule seats six passengers in a circle and is large enough for onboard commuters to float freely and perform head-over-heels somersaults. Each window — measuring 42.7 inches in height and 28.6 inches across at the bottom (108.5 by 72.6 centimeters) — is made of multiple layers of fracture-tough transparent material that is "designed to provide crystal clarity of the incredible views before you," Blue Origin representatives wrote. "Minimizing distortion and reflection, the windows transmit 92 percent of visible light — as good as glass." 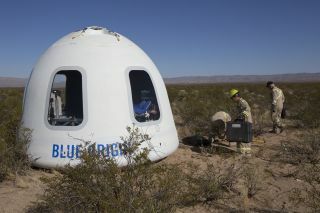 The New Shepard capsule flown by the company in 2016 sported painted-on windows. That changed last year. "Now we're flying our windows that are really geared to space tourism. They only pass visible light," said Erika Wagner, business development manager for Blue Origin. "They've been heavily tested on the ground, and we're now testing them in flight," she told Space.com, adding that the windows are fabricated by the company. Wagner told attendees of the 2017 Next-Generation Suborbital Researchers Conference last December about window availability: "They are gorgeous … every seat is a window seat and an aisle seat." SpaceShipOne returns to the runway following a suborbital flight. Passengers plunking down dollars for flight into space demand an outstanding view, said famed aerospace engineer Burt Rutan, designer of SpaceShipOne, the first privately financed spacecraft to carry an ordinary citizen into space. "I applaud Bezos for recognizing the need for big windows," as they are a must for maximizing a passenger's experience, Rutan told Space.com. Rutan also underscored the engineering design issues, materials required and rigorous stress testing needed when fabricating shatterproof windows. He pointed out, for example, the small porthole-like windows used in the Concorde supersonic transport program. These were sized so that, if one blew out, the high-flying aircraft would maintain enough pressurization to keep people alive during the plane's descent. "At well above the highest pressure, on the ground, I gave a sharp welding hammer to the pilots of SpaceShipOne, challenging them to break the polycarbonate outer window. Then, they never worried about window strength while in space." Rutan said. The window size of Blue Origin's New Shepard vehicle, compared to those of a Concorde supersonic jet and a Boeing 747. For SpaceShipTwo — which Virgin Galactic is developing for passenger flights to suborbital space — Rutan drew up preliminary specifications and goals. "Beyond that, I didn't do design work on the Richard Branson commercial space program," he said. "I did spec out a nine-passenger vehicle, not six. I made some decisions all based on maximizing the experience," including having center seats. However, that design choice, as well as a highest-point goal of 81 miles (130 kilometers), was not pursued, he said. "What you pay for is the prestige of being an astronaut," by getting to 62 miles (100 kilometers) above Earth, Rutan said. Reaching this boundary, known as the Kármán line, earns the space traveler an astronaut badge. Rutan said he loves the fact that Bezos' passengers can sit up in front of an enormous window. "But why launch them for a very short flight," he added, "over the ugliest area in the world to look at — West Texas!" Blue Origin's windows provide a much different view than the one enjoyed by America's first human suborbital traveler, Alan Shepard, aboard his Freedom 7 Mercury capsule flight in May 1961. He was provided two 6-inch (15 cm), circular portholes. Indeed, the pioneering Mercury astronauts pressed for a large window, primarily for visual confirmation of the capsule's orientation toward Earth. By the time Gus Grissom's Liberty Bell 7's suborbital hop had taken place in July 1961, an enlarged "observation window" had replaced those portholes on Shepard's suborbital flight. The new trapezoid-shaped window measured 19 inches high by 11 inches across (48 by 28 cm) and was positioned directly above the pilot who was squeezed into the single-seat vessel. As Blue Origin points out, the New Shepard capsule yields over 10 times the room Alan Shepard had on his suborbital flight aboard the Mercury capsule. The International Space Station's Cupola gives crew members a 360-degree view around the orbiting complex through six trapezoid-shaped windows and one large, circular viewing port. Alan Shepard prepares to board his Freedom 7 capsule. The spacecraft, which took Shepard to suborbital space in May 1961, originally came with portholes for viewing, but those were later changed to a trapezoid-shaped window. For spacecraft builders, putting in windows was once viewed as offensive to an engineer's sense of structural integrity and design elegance. Over the decades, there has been a progression of quality windows for human space travel, from the two-seat U.S. Gemini spacecraft to the Apollo moon landing effort, to the American Skylab experimental space station program, and then to the space shuttle era. But for orbital space travel, windowwise, nothing matches those of the International Space Station's Cupola, a European Space Agency-built observatory module. Cupola means "dome" in Italian. Until its seven windows arrived in early 2010, ISS crews peered out of small portholes, or, at best, the 20-inch (50 cm) window in the U.S. Destiny laboratory. "Star Wars" fans take note: The ISS Cupola, which is 4.7 feet tall by 9.8 feet wide (1.4 by 3.0 m), has been compared to the cockpit window of the Millennium Falcon. The Cupola was developed and built by Thales Alenia Space in Italy. It allows ISS crewmembers to get a 360-degree view around the orbiting complex, through six trapezoid-shaped windows and one large, circular viewing port — the largest window to fly in Earth orbit. Windows are a vital experience of space travel, said Karen Scott, a consultant and optical scientist. She is the former director of systems engineering for Sierra Nevada Corporation's Dream Chaser space plane program. But first of all, are windows dangerous add-ons to spacecraft? Every system on a spacecraft needs to be designed correctly, tested thoroughly and needs to include redundancy, as a failure would be catastrophic, Scott responded. "Throughout the many decades of the U.S. space program, there hasn't been a catastrophic spacecraft window failure," she said. Given the promise of commercial suborbital space travel, just how important, from a marketing standpoint, are big windows? "The view of our beautiful planet is the destination, on the short ride into suborbital space," Scott responded, "otherwise the space tourists are just weightless sardines in a can." The experience wouldn't be much different than doing a few weightless parabolas in an aircraft that provides roller coaster micro-gravity maneuvers, she said. "Many astronauts have described emotional experiences seeing the Earth from space. They have taken millions of photos trying to capture the beauty that they see and they say that the photos never do the view justice," Scott added. "Large, clear windows provide the illusion that there is no structure between the astronaut and the Earth. It's a more personal experience than say looking at images on a screen. When the [ISS] Destiny science window was launched," she pointed out, "the astronauts said it was so clear they felt they could fall through it to the Earth." Scott said that many astronauts during their free time choose to just watch the Earth go by. "So, yes, I think good-quality windows are essential to the experience of flying in space," she concluded.